Not so long ago, baking was more than a simple process of science and measures; it was a craft honed by artisans and passed from generation to generation in the family kitchen. Such a setting is where Adele Gregory, owner and executive chef of Adele’s Creative Catering, began her culinary journey. Gregory recalls spending weekends with her, staying up into the wee hours to spend time with her in the kitchen, watching her bake. These early experiences set Gregory on a long and winding path that would ultimately lead her back to the kitchen. She joined the U.S. Air Force right after high school, serving in locales including Aviano, Italy, and Shreveport, La. She then tried her hand at a career in law before coming full circle and deciding hospitality was the industry where she felt most at home. Gregory’s culinary inclinations were present throughout her journey. It was in answering a military colleague’s request for a tank-shaped cake that she discovered her talent for cake sculpting and, during her time in Louisiana, she had a job crafting pastries alongside the experts at Copeland’s Cheesecake Bistro. Summing up in a few words her ever-present desire to learn and grow, Gregory says she believes “Idle hands are the devil’s workshop.” If that is the case, she needn’t fear, because not many pairs of hands have stayed busier than Gregory’s. 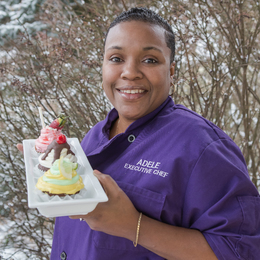 She started her cake business, White’s Cake Mix, in 1992, and opened Adele’s Creative Catering approximately eight years later. This much is evident just by looking at some of her signature dishes and pastries, such as her grown-ups-only Hennessey cake. For this best-loved gem, Gregory bakes one of her classic fluffy pound cakes and infuses the entire cake with Hennessey cognac while hot. Then, she pours a vanilla bean curd buttercream frosting overtop. “I love alcohol in baking,” says Gregory, who also has devised a line of adults-only cupcakes infused with liquor. One variety, which has been a top seller for occasions such as bachelorette parties, is strawberry margarita. These cakes feature strawberries soaked in strawberry shortcake vodka, Patrón tequila-infused icing and edges that are salted just like their cocktail cousins. Gregory even serves these sweet treats with straws for sipping the tipsy filling from the center of the cakes. Gregory does, of course, craft more traditional cakes for weddings and kids’ parties, but the roster of available flavors—which Gregory is always adding to—is hardly run of the mill. Her seasonally rotating selections of flavors include pumpkin, cinnamon apple, egg nog, butterscotch, jasmine honey, salted caramel, pineapple, strawberry, orange Creamsicle, blackberry, lime and raspberry lemonade. Her selection of cakes has come to include 37 flavors in all. Other popular creations include her sweet potato pie-infused variety and her blueberry orange, which features fresh blueberries, blueberry compote and orange icing. The ever-ambitious Gregory has extended her services even further by offering help with travel arrangements through her company, Adele’s World Travel. Gregory is the first to say the business has come a long way from that first gig—where she alone put on the wedding for 275 people—to now, when she has a staff of 25 people and more than a decade of success under her belt. Keisha Harris, manager for Adele’s Creative Catering, acts as a second in command, working in roles including planner, set-up coordinator and even server. Harris, who has worked with Gregory for more than 10 years, says that she’s noticed over her time with the company how genuinely and quickly people take to Gregory. Harris says Gregory has even inspired her to pursue her own culinary passions. Harris hopes to launch a food truck in the future. Gregory notes that one of the things she likes best about her work is that she gets to work with a wide spectrum of people and cuisines, which present new opportunities to learn and grow at every turn. For more information on Adele’s Creative Catering, or to see photos of her cakes and catered affairs, visit www.adelescatering.com.